Looking back at the list of catfish of the month articles prior to this one (an expanding list - this is the 68th! ), I was surprised to find Synodontis decorus was yet to be featured. Time yours truly thought, to right that wrong. Clown is a name often given to fish, clown anemone fish, loaches and plecos all bear than moniker either because of bold, often brash colouration or because of comical or quirky captive behaviour. This is true of S. decorus too. As juveniles they are amongst the most striking of a genus blessed with some real "lookers" their large black clown spots and horizontally striped flag tail are complemented by lovely black ribbons flowing from their top mast. The fish keep these as they grow and it is a real challenge to the aquarist to stop other fish trying to nibble them. As ever, there is a catch. Keepers of the oafish beauties often remark on their shyness, appearances in broad daylight are rare and usually limited to feeding time and even then an appearance is not always forthcoming. In the main this is simply put down to the fish being strictly nocturnal - a fact borne out by a fairly large eye size. Oddly however the fishes are often seen being very active in dealers tanks, especially when imported and housed in numbers within the one tank. Perhaps there is more to their reclusivness than straight forward light shyness. To discuss this, bear in mind two factors. The first is the shoaling, the second eating. Due to its large adult size this fish is not commonly kept in numbers once purchased. Many other Synodontis species become reclusive if kept alone - many are positively gregarious when kept in shoals. 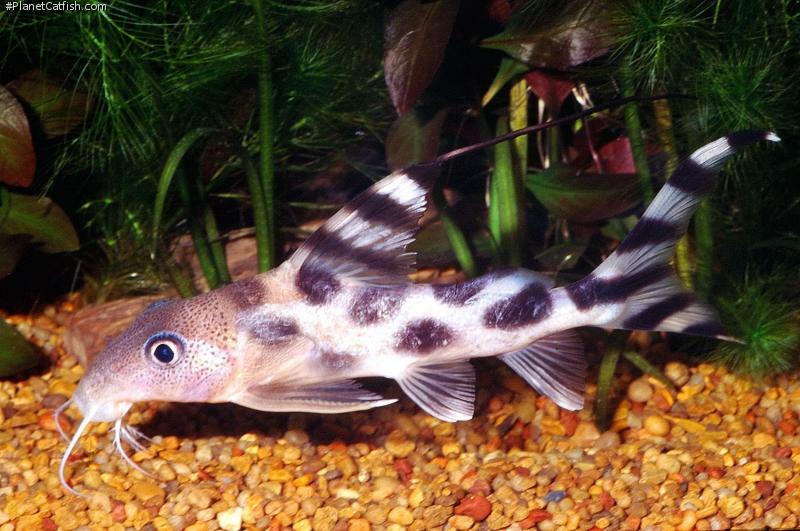 The common upside down catfish (Synodontis nigriventris) is a good example of this. S. decorus does not appear to be one of those more aggressive Synos that will rip the fins of other conspecifics (fish of the same species) or even similar fish like other Synodontis species or even other catfish. So if you have a large tank, why not try a group of them? Second thought is feeding. This fish will eat for all its worth at any given opportunity, typically when housed with cichlids there is a lot of food flying around at feeding time and these catfish are ideally placed to pick up all the scraps, especially after lights out. They will gorge themselves (the size to which their bellies swell can be quite grotesque and has prompted more than one panicky email to this webmaster I can tell you) at any opportunity and then retreat to their chosen cave or pipe to sleep it off. Often the fish will not been seen again for days - it simply has no need to eat or venture into the daylight. Feed your fish less but a little more often (thus keeping non-catfish well fed) and you will see more prowling from your syno. Other keepers have mentioned other theories to me in the past, another is to keep the fish in tank bare expect for substrate and floating plants. Apparently the Synos remain active all days long, do not become quarrelsome and appear at ease with this set-up. At the end of the day all these things are worth experimenting with a group of these fish in a suitability large aquarium. Etymology Synodontis: From the Greek syn, meaning together, and odontos, meaning tooth; in reference to the closely-spaced lower jaw teeth. Decora means decorated. Juveniles have a long filament on the leading dorsal fin ray. Tan background colouration with black spots. One of only three Synodontis species (with S. clarias and S. flavitaeniatus) with filaments on both maxillary barbels and mandibular barbels. Distribution Congo basin except Luapula River system. One of the many interesting Synodontis species found in Malebo Pool. Feeding Eats crustaceans, algae and insect larvae in the wild. Is not a fussy eater in the aquarium. Will accept flakes and tablet foods. Periodically supplement with frozen food (e.g., krill, brine shrimp and bloodworm) and live food. Furniture Rockwork, driftwood, sections of pipe with a diameter of 10-12 cm. Grows to about 30 cm, so will need at least a 200 litre tank when it reaches adulthood. This fish does not like bright lights, but with sufficient cover, such as floating plants, it will make the occasional appearance with the lights on. With bright lights, it will sometimes dash out for food, but will otherwise keep itself hidden until the tank is dark. Compatibility Compatible with all but tiny fish. Can hold its own with large, aggressive fish, but best kept away from fin-nippers which might be tempted to pick at the filament on its dorsal fin. Suggested Tankmates Large enough to hold it's own in any American cichlid tank, larger individuals will even adapt to African rift lake cichlid tanks. Best kept with larger African characins and barbs.